Well proportioned inner city tranquillity. Residential redevelopments within the restricted footprint of established inner-city suburbs invariably require an inventive approach to efficient space allocation. 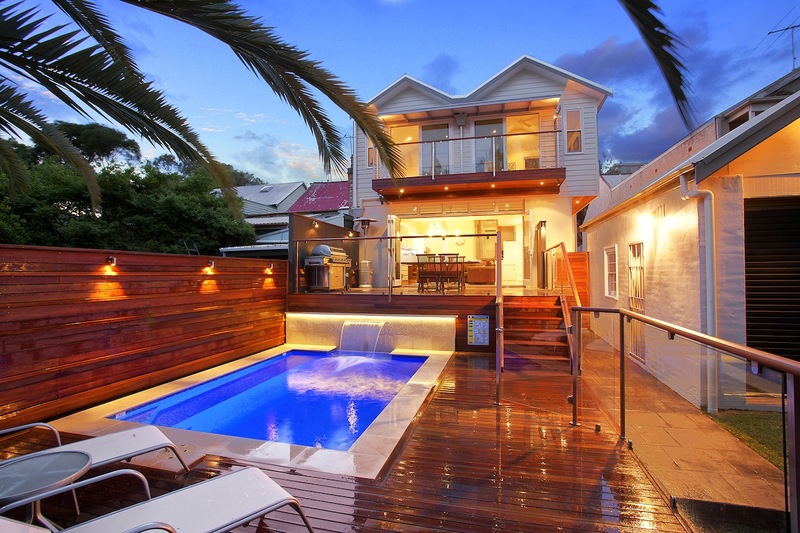 This is particularly evident when the home owner’s primary objective is to build a family orientated new dwelling that takes full advantage of Sydney’s indoor/outdoor leisure lifestyle. The slope and orientation of this small site would have presented a less imaginative pool designer with a litany of issues. Ben Thompson of Sunset Pools observed the way light moved across the property and the topography of the site making sure that practical solutions accomplish the most in the available space and light, planned architectural characteristics are respected and that natural features and site attributes are incorporated into a sympathetic Sunset Pool design. 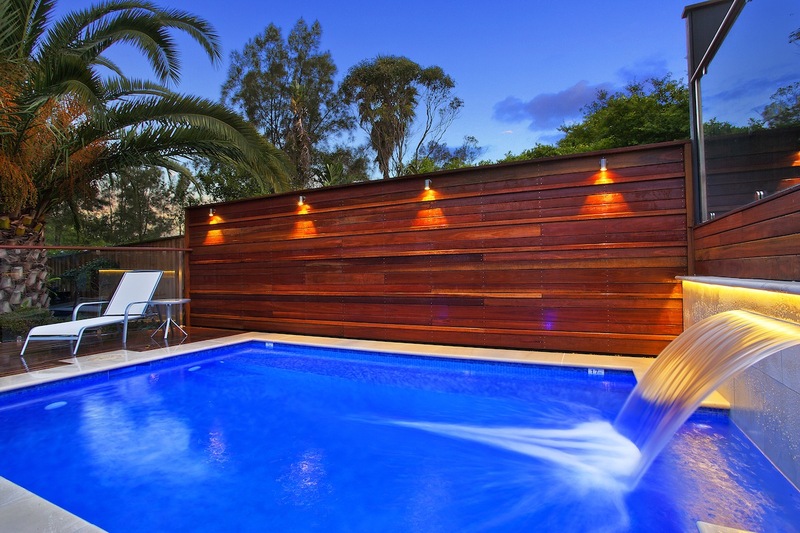 This compact pool’s simple lines, transparent safety fencing and continuity of timber decking create a well proportioned and stylish leisure area in perfect harmony with the new home’s architecture and the needs of its young resident family. 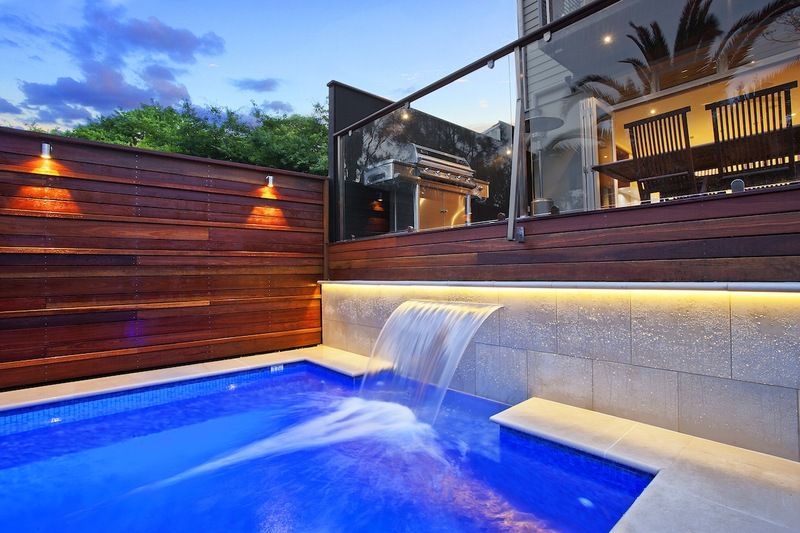 As soon as you have a clear idea of what your dream home should include, Sunset Pools will delight in discussing your objectives and realising your dreams. Call 1300 000 412 or complete the enquiry form to put your plan in action. 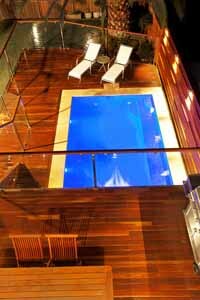 Special Sunset inclusions have been built into this otherwise traditional geometric swimming pool design. These include consideration for the homeowner’s young family, and the desire for parental supervision. An “L” shaped seat extends along the boundary side and under the water cascade providing a consistent shallow area regardless of the adjacent pool depth. This Sunset inclusion provides a continuous shallow section for the children, and ready access to locations where they can either stand or leave the water without assistance. 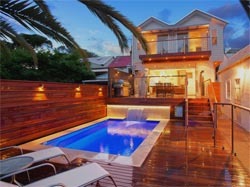 Adult members of the family also enjoy this feature’s versatility, it provides an excellent place to sit and socialise with friends on sunny afternoons and relax on warm Sydney evenings. 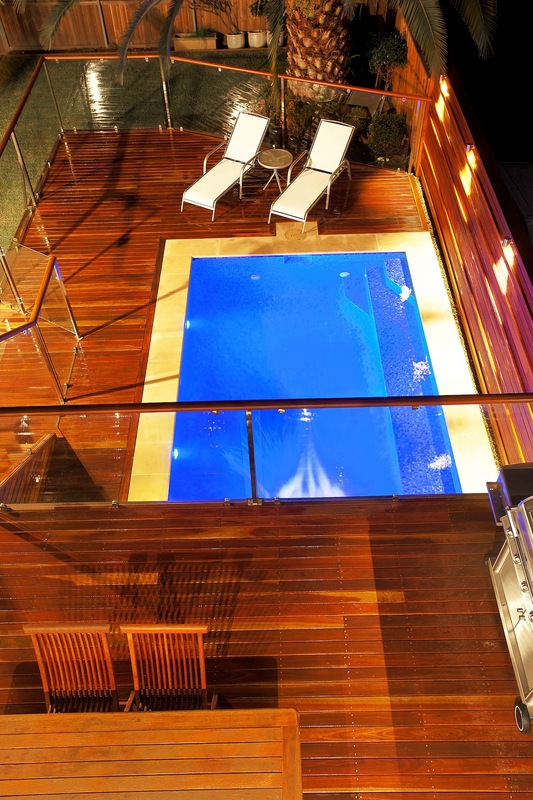 The relevant levels of the deck and pool have been designed and intentionally built to facilitate clear lines of sight from the adjacent entertaining and barbeque areas. This design attribute enables the entire outdoor area to be utilised in a similar manner to the residence’s internal open plan spaces. This is an example of an Aspect of Sunset Pools design methodology that considers the whole lifestyle experience, and the practical utilisation of available space. Sunset Pools took special notice of how the swimming pool, water feature and outdoor areas would combine with adjacent indoor accommodation and outlooks to form a perfect environment for contemporary indoor/outdoor recreation, leisure and entertainment. A consideration that ensures the whole space works well regardless of the project’s individual scale. Fundamental to Sunset’s design, was the inclusion of a contemporary water feature that not only animates the glistening pool surface to reflect the sky, but also creates shimmering light patterns after dark. In addition to looking great and creating a fascinating focal point, the cascading waterfall effectively masks the ever present background ambiance of inner-city living, creating natural tranquillity where traffic noise would otherwise prevail. 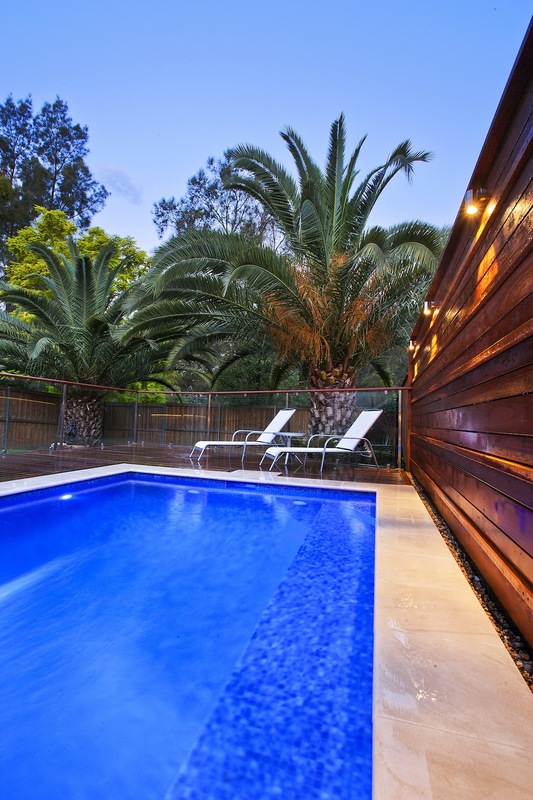 The pool has been constructed and equipped to the “Sunset Standard”, an exceptional degree of automation and superior specification that bestows a desirably low level of maintenance. The water sanitation, filtration, and pool heating are all digitally monitored and automatically adjusted to maintain the owners preferred conditions. 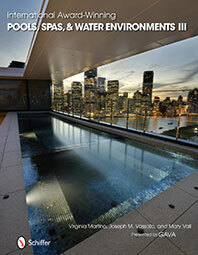 System hydraulics for the pool and cascading water feature are independently controlled from inside the home. Multiple water returns from the integrated pool heating system effectively eliminate the “cold spot” that are traditionally associated with straight edged swimming pools with square corners. If you need to make the most of limited space, want a pool design that incorporates value added attributes you may not have even considered, call Sunset Pools today to redefine the possibilities. Telephone 1300 000 412 or complete the enquiry form today.